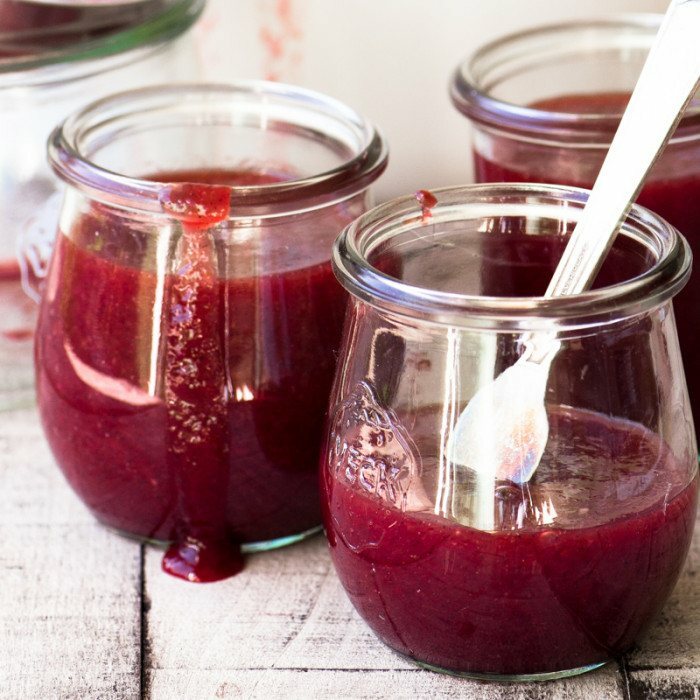 Blood Orange Jam ~ this easy small batch jam has a bright delicate flavor with berry overtones, and a glorious color, with none of the bitterness of marmalade. Remove the peels from the oranges. I do this by slicing off the very top and bottom, and, with the orange firmly sitting on my surface, carefully cut away the peel, from top to bottom, working my way around the orange. Try not to cut away too much of the flesh, but do remove the bitter white part. Discard the peels. Thickly slice the oranges and remove any seeds. Puree the oranges, in batches, in a food processor, and then put in a large pot, preferably one with a heavy bottom to prevent scorching. Stir in the sugar and lemon juice, and add the vanilla seeds and pods. Bring up to a boil, lower the heat to medium, and boil for about 40 minutes until the mixture has reduced by at least 2/3, and has thickened. Stir frequently, especially toward the end when it could scorch. Be aware that the jam will thicken even more as it cools. Remove the vanilla pods and push the jam through a mesh strainer. I use the back of a large spoon to force as much as possible through. You should only be left with a thin layer of solids. This step is optional. Fill your jar or jars and let cool before covering and refrigerating. Jam will keep at least 3 weeks in the refrigerator, or up to a year in the freezer.